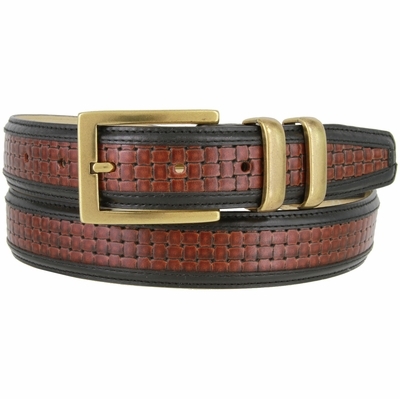 Basket-weave Embossed Genuine Italian Dress Leather Belt. 1-1/4" = 32mm wide Italian Leather with Basket-weave Embossing. Stitched Antiqued Brass Buckle and Keepers. Feathered Stitched Black Trim Leather Edges and 5 Adjustment Holes with Classic Tapered Tip.